Superman Busted for DUI – Really! If you were busted for driving under the influence in Los Angeles, you may be feeling pretty ashamed and depressed. Don’t beat yourself up too much, though: even Superman occasionally gets a DUI. Last week, 33-year-old Christopher Reeves of Utah (no relation to the actor Christopher Reeves who played the Man of Steel) was busted for drug DUI per the David Country Sheriff’s Office. 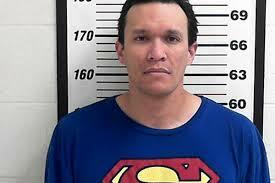 In his mug shot, Reeves wore a Superman shirt. Authorities charged him with possessing methamphetamines and DUI and set his bail at $15,000.00. A local deputy said he saw the 33-year-old erratically driving early on Tuesday morning, “performing weaving maneuvers, drawing the attention of deputies.” When police searched his car, they allegedly found massive amounts of methamphetamines, as well as drug paraphernalia and Spice – a synthetic kind of marijuana. The local Sheriff’s Office wryly commented “I hope he will live not to regret the choice of T-shirt on this day, but rather his actions.” Reportedly, the paraphernalia and the amount of drugs found in his car was “plenty to distribute around” – and indicated that Reeves could face distribution and intent to sell charges, which would make his criminal situation far more dire and complicated. His arrest raises an important issue that needs to be discussed – the distinction between over-the-counter meds and illegal narcotics, such as meth, LSD, cocaine, etc. You might think the law would classify these drugs differently, from a DUI standpoint. If you’re high on over-the-counter vicodin or Benadryl while behind the wheel, that doesn’t seem “as bad” as being high from pot or cocaine. However, California Vehicle Code Section 23152 (a) doesn’t really care about what got you high — it just cares if you ARE high. And if you are, it’s a criminal offense: the statute does not distinguish between street drugs and legally prescribed medicines. The statute only cares about the level of impairment. It concerns itself with the end result: did you take a substance (alcohol, drugs, other) that made you a dangerous driver? So how can you fight back against such charges? Law enforcement does not have the equivalent of a breathalyzer to test for drugs like prescription meds or marijuana. Prosecutors rely on the expertise of Drug Recognition Experts (DRE), who use field tests and other methods to identify potentially drug impaired drivers. Authorities also use blood and urine tests. If you or someone you love needs to find a Los Angeles DUI defense attorney, call Michael Kraut of the Kraut Law Group today. Mr. Kraut is a former Deputy District Attorney (ex-prosecutor), and he has tremendous experience defending complex DUI cases. He can help you create a smart and astute defense to your charges.